Finances are a cornerstone in a solid relationship with your partner. Starting on the right path as a young family is important. Our 20s can be especially turbulent times. Many are getting first jobs that pay decent money, finding partners, and maybe even having children. After years of going to school, we feel that it’s time to live life. And we should live life, but not at the expense of racking up debt and living paycheck-to-paycheck. Living with intentionality is key. 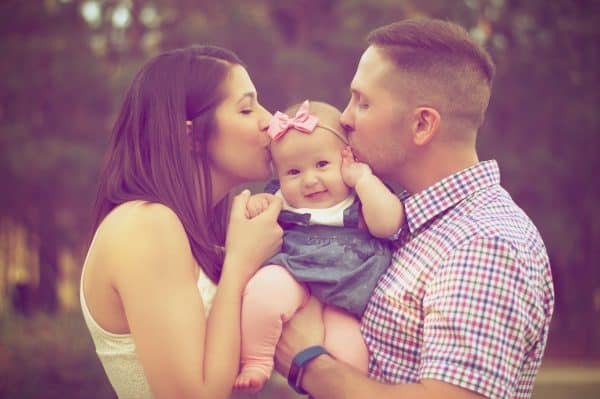 Below is a case made for why improving your finances as a young family is so important, followed by three actionable steps to get started. During the past several weeks, I’ve had the opportunity to co-lead a Financial Peace University (FPU) class. FPU is a nine-week course offered by Ramsey Solutions focused on encouraging people to get out of debt and transform their financial lives. Leading the class has been a great experience. I have especially appreciated the opportunity to help teach the lessons to young families. Now, I’m not sure if forgoing marriage counseling for a Financial Peace University class is the best decision. However, it does go to show the value her mother put on ensuring this young family was financially literate. This young family attended every class and I have no doubt their financial lives will be improved as a result. I’m embarrassed to say that I knew very little about personal finance in my 20s. This is particularly embarrassing as I went to college to study economics and finance. Up until the age of 25, I primarily worked in food service as a server, bartender, and caterer while attending school. At age 23, I lived on my own without support from my parents while attending grad school. The money wasn’t bad but I never made more than $25k per year. At the age of 25 I got my first job in my area of study making $50k per year. Finally – real money! Now, it was time to live life. During my late 20s, the debt continued to pile up. A wedding, house, vacations, and student loans always had us burning through savings and taking on more debt. By age 30 my wife and I had accumulated about $100,000 in mortgage debt, $50,000 in student loans, and $25,000 in other miscellaneous debt such as car payments. That’s when we finally woke up. When I read about individuals in their 20s frustrated about not making financial progress, I can totally relate. However, if you’re reading a blog like this before the age of 30, chances are you will be more successful financially by the time you reach my age (37). If you plan to start a family someday, having your financial act in order is critical. Engagement rings, weddings, children, insurance, mortgages, and on and on can be really expensive if left unchecked. Did I mention that children are expensive? The statistics show that while financial literacy is improving, there’s still a long way to go. Money continues to be a top reason for fights in a relationship and one of the leading reasons for divorce. Below are three ways that you can improve your young family’s financial situation. By making sound financial decisions early, you can set your financial foundation for a lifetime of success. Even though we were financially a mess heading into our 30s, the one thing we did right was keep our lifestyle reasonable. We owned a home, but weren’t house poor. We had car payments but didn’t go out and purchase new cars every few years. And even though we had about $50,000 in student loans, we weren’t saddled with high interest credit card debt. I’m not sure if this would have been the same if we didn’t wake up before our mid-30s. Now that we are in our late 30s, the pressure of keeping up with the Joneses is real. I struggle with it often. Without a financial plan it would be challenging not to give in. Thankfully, when we had our “ah ha” moment it wasn’t too late to turn things around. While it’s never too late to turn your life around financially, the further down the path of debt and lifestyle inflation you get, the longer it will take to dig out. Becoming financially literate early will allow you to minimize the temptation of lifestyle inflation until you can afford the life you want without financing it. One of my early posts provides the benefits of compound interest through the story of Bill and Susan. To summarize the blog post, investing $5,000 beginning at age 25 for 10 years would leave you with more money at age 65 compared to a 35 year old who invests $5,000 for 30 years. Too often I hear young professionals say they will worry about saving for retirement later in life. This can be a catastrophic mistake. Not only are you potentially leaving free money on the table through a company match, you cannot get time back on your side to fully take advantage of compound interest. The earlier you can start investing, the better. If you have a young family, knowing that you have started investing early will provide more flexibility later in life if you lose a job, take a pay cut, or something worse. Find a way to get started with investing as early as possible, even if it’s only $25 a month. Become dedicated to creating a gap between your income and spending. Grow that gap by looking for ways to increase your income and reduce expenses. Becoming mindful about money early in life will give you the opportunity to set your financial foundation. Having a strong foundation will provide more flexibility as you grow your young family. Your financial foundation can be made of retirement savings, low expenses, a livable wage, passive income, or debt free assets. Having a strong financial foundation has allowed us to go from two incomes to one so my wife can stay at home with our young children. This wouldn’t have been possible without a strong financial foundation. While moving to one income may not be the desired outcome for your family, something will come up later in life where you’ll need financial flexibility. It could be a job loss, divorce, sick family member, car accident, or an aging parent. Make sure you start getting your financial ducks in a row as soon as possible. Financial information can be overwhelming. If you are like many families and living paycheck-to-paycheck, below are a few actionable steps that you can take to start setting your financial foundation. Regardless of your income level, you can start by simply tracking your expenses. Make a commitment to track every penny you spend for two months and see what happens. This is simple, yet hard to do. Regardless, the results can be powerful. If your income is low and expenses are high, you may not have an opportunity to save much or pay off debt initially. However, tracking your expenses will allow you to take control of your financial situation. It will help you develop a plan. You will think twice about those impulse purchases that we all make at times. Second, set a goal to save up an emergency fund of $500 to $1,000. This will give you some cushion when small emergencies happen, such as a flat tire, broken dishwasher, or unexpected doctor’s visit. This is so important early on as there is nothing more frustrating than having to go further into debt to cover unexpected expenses. This one is a bit more complex, but after tracking your spending for a few months and building a small emergency fund, look in to automating your finances. What is “automating your finances”? It simply means setting up systems to automatically invest, save, pay down debt, or pay your monthly bills. Here’s a recent post of mine with more information on automating your finances. The journey of a thousand miles starts with one step. When we started to get our financial life in order about seven years ago, it was difficult to know where to start. This was at a time when I was still early in my professional career and my wife was back in school funded by student loans. We barely had any gap between income and expenses and in fact, the gap was probably negative as we were accruing thousands of dollars in student loans. Limiting lifestyle inflation, investing early, and setting a financial foundation will allow your family to get off to a great start financially. Not sure where to begin? Start small by simply tracking your expenses and building a small emergency fund. Once you’ve done this for a few months, look into options to automate your finances. Like most personal finance related topics, the concepts are easy, but the doing is hard. Take the first small steps to get started and you’ll be surprised how much you’ll be able to accomplish over the next several years. It’s very important that never hurt anyone for money. You can make money, you can lose money but never make someone sad because for a period of time you had money. People change when they have money. They get utmost confidence and superiority. That’s the real worth of money and thanks for the posting. I’ve heard others say that money is an amplifier and I’ve found that to be so true. Good people with money with do more good things. Bad people with money will do more bad. Thanks for commenting! I’m so thankful that my husband and I are on the same page when it comes to our finances. It’s made this first year a lot less stressful than it could be. I mean, she couldn’t *make* her daughter go through any kind of pre-marital counseling, but I definitely appreciate the sentiment. There are so many ways to do money, but being on the same page with your partner is most important. Bah, I guess you’re right as usual. She was pretty adamant though! You’re right there are many ways to do money. My wife and I still have separate bank accounts and it works for us. Even with her being a sahm now, part of my check goes directly into her account. Some will say that separate accounts are bad in a marriage but it works for us so *shrug*. I just read through it and we are totally on the same page with separate accounts. It’s a little more complicated now since we are a one income family, but since the timing of my wife stepping away from her teaching job aligned with paying off our mortgage, the two offset and not much really changed for us. Anyway, I loved your comment about being able to save a bit more on a strict budget, but that would not make you happy (and saving nearly 50% is amazing btw). Thanks for sharing. If anyone else wants to check out Angela’s guest post see the link below. I can imagine it’s a bit more difficult with a single income family, but I love that you still do it! Would love to read more about how it works for your family. Added to my list of future topics. This is a great idea now that we’ve being doing it for about 6 months. Thanks for the suggestion! Make sure I see the post whenever you get around to writing it! I’m the 35 year old that just got debt free, lol. I just got to hustle more and try to do what I can to win back that lost time. This is motivating to help my kids not make the same mistakes I did. Well to make you feel better, I was a finance major in college and didn’t pick on these personal finance topics until nearly 30 years old. Thankfully I’ve always invested in my company 401(k) at least up to the company match, but I wasted so much money in my 20s. I’m the 37 year old guy who became debt free and am just now starting to focus on building passive income. It’s never too late.